Kerkhoven, Minnesota — We had been talking about the new dairy factories here in western Minnesota, my friend and I. We finished adding the 4,000 cows in the first one to the 10,000 in the next one, then the 10,000 cows in the just-completed one as well as the 10,000 in the just-proposed one. That is 34,000 cows, all within 12 miles of my house. The question floated there in the air, neither of us wanting to answer it too specifically for fear of what it would reveal about the future of the agriculture we had spent our lives practicing. After all, we had both been willing enough to modernize and expand in our farming and also hire help when our farms grew a little beyond what we ourselves could manage. Where to draw the line? What separates our lives from some of the practices we see around us that we don’t much admire? If you think about it, this little saying provides the standard; helps us draw the line. The attitude my father warned me against forms the philosophical basis for slavery despite our attempts to put fancy-sounding political and economic theorizing on it. One trouble is that we have coddled grain farming in this country long enough now that some of the practitioners of this basic art of grifting at government expense have gotten a pretty inflated opinion of themselves. Some of them are now “investors.” They want the manure because phosphorus prices are getting high. They want the profits, if there are any, and they seem to need ten thousand cows to stand on in order to hold their heads up in the world. It is doubtful that anyone who ever spent his life working with livestock, much less anyone who really thought about the meanings and implications of animal husbandry, can be very comfortable with this agriculture. But this is more than the anger of a certain part of the rural population against another part. The current situation bespeaks our basic inability as a people to make good, sound decisions about anything. And we don’t understand our land any better than we understand each other. Anyone can, as I have, take the time to drive through what was formerly dairy country after a significant rainfall to see those wide and deep gullies coming down the creases between hills, usually with the corn rows but cutting across as gravity dictates. Two inches in June will cause gullying deep and wide enough to hide a small car in some of these places. And in one year! Where are the sod crops? Why so much corn? The best of the former family dairies kept much of this in check. Cattle require forages, hayfields and hopefully pastures. Manures are the best fertility. Family labor, when not abused, is the best way to tend domestic animals and raise children. It will not do to sing unqualified praises of these farms. Some were not good, some needed much change to become good, some should have been shut down. But the idea was workable. It could have been improved upon. We ran right past what the land needs because we would not take on the hard work of understanding what was needed to keep agricultural production dispersed and agricultural people on the land. I was surrounded by family dairy farms in my youth here on the flat, black fertile land in the northern Corn Belt. What happened? They are all gone. Have been for 30 years, victims of overpriced land and, as everywhere, a predatory marketing system. The elites are to blame. Wall Street. Industry. The boosters and lovers of the money to be made foisting too much technology upon us. I have said it myself, and more than once, and it never gets to be less true. But also, there is us. Our idea of ourselves has changed. The peasant wisdom about work we think we are too good to do doesn’t have much of a hold on us anymore. We still know, most of the time, that it’s wrong to force another human to do what we think is beneath us. That responsibility we have given over to technology. And technology offers us the illusion that it can answer ethical questions and dilemmas on the cheap. Having acquired a few tools that make our physical lives easier and thus more prone to disease and ill health, we find we want more technology so that we may do even less. Of course the technology must be paid for, and so we work more, and worry more. Our technology saves physical work while its cost increases mental and emotional distress. We have reached the point where our lives have gotten so easy that we cannot afford a day off. While we have been maneuvering ourselves into this Catch-22, the world around us has been changing. When the powers that be decided that the farm population needed to be reduced a half-century and more ago, the logic was that the people were needed in the factories. The siren call was to leave the drudgery of the farm and come to where you could make enough money to buy things for yourself and your family. Farms shrank in number and grew in size while the manufacturing capacity of the country grew into the envy of the world. People thought of second cars and vacation homes. But then several decades ago the elites decided that the manufacturing should be shut down and shipped overseas. Now, other than the few places available in the first professions (teaching for example, which is also being shut down), most of the grandchildren of the people who left the farms have few options left to them. For many families the status “permanently unemployable” looms as a frightening possibility. I am left to wonder if many would not like their great-grandparents’ lives back again. Compare a 1950s farmer, one of the better sort, with the situation on today’s dairy factory, and study it for what it says about our concept of work and how it has changed. Drawing on the wisdom of his forbears for whatever that was worth, and on his own gumption, the 1950s farmer scheduled his cows’ calving for when the feed was available for the best milk yield, with an eye to the fact that he also had to have the time to see to the crops in a timely fashion and that it is not always easy to fight the weather. He ran his day so that the chores got done on time, the milkings were an appropriate time apart, and the jobs requiring more than just he and the hired hand took place when the kids were home from school. He figured some of his work was going to be nasty, but at other times satisfaction would be more available. He assigned his hired help and his kids’ work in such a way that they would keep coming back. He worked with them, teaching them and learning himself that often the hardest part of a hard job is getting it started. He learned and lived the idea that a stitch in time really can save nine, that debt was something to work your way out of, and that the protection of some long-term assets and virtues and values was going to require a certain amount of unpaid work. He learned the sweetness of rest after hard physical labor, and the joy of testing himself against the farm and the work. He came to understand himself through his work, through his failing, and his coming through when he had to. The factory dairy hand works without agency. He has nothing to say about his work, can do nothing to modify and improve it, and can only hang onto it for as long as he can live on the little pay, or until a robot can be devised to do his job. He has no stake. Those who do have, the investors, have only a financial one. The understanding in the whole system is that the biggest sucker is the one who works, and the biggest winners are those who do not. The land, which the worker also doesn’t control, is either a depository for manure or a source of feedstuffs depending on the time of year and what arrangements the investors have made. No thought is given to the potential for erosion or to the building and maintenance of soil health. Indeed, there is no one available anymore to understand either the need for, or the particulars of, achieving and maintaining soil health. That work would have been the natural province of the grandsons and daughters of the 1950s farmer mentioned above, and the few that are left of this breed are overworked, confused and often in conflict with the banker. That farmer has essentially been disallowed from agriculture. We seem to have advanced ourselves completely out of the possibility of decent work. And how far away from slavery is that, really? Jim Van Der Pol grazes and markets from his farm near Kerkhoven, MN. Interested in writing for Graze? 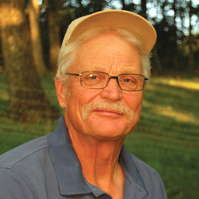 Cheesemaker Andy Hatch discusses the possibilities of combining good grazing management and high-end cheese production. Jim Van Der Pol sees a need to address some farming issues that were set aside in building a marketing business. The advisors tell how they get stock water to their paddocks. Internet marketing offers a lot of promise; John Arbuckle details how it can work for you. Love cows? Kids or grandkids love cows? Then check out the new picture book for ages 2-6 called Which Moo Are You? If you are a fan of Jim VanDerPol's writing, you will want to see his book, Conversations with the Land. The book includes many new columns which have not appeared in Graze. Go to the Books page for more information about these books or to order.